With an A21REL-12, your Campbell Scientific data logger can control up to four external ac or dc devices. This relay driver has four internal relays. The A21REL-12's internal relays are single-pole double-throw. This relay driver may be powered by the data logger power supply or a separate 12 Vdc battery. CR500 (retired) The CR500 has only one control port capable of providing a control signal. CR510 (retired) The CR510 has only one control port capable of providing a control signal. 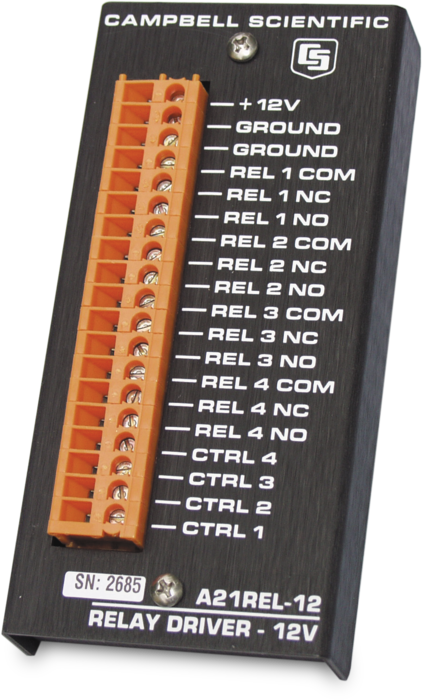 Each of the four relays is controlled by a data logger control port. The A21REL-12 may be powered by the data logger power supply or a separate 12 Vdc battery. The A21REL-12 requires a non-condensing environment. No mounting bracket is available. 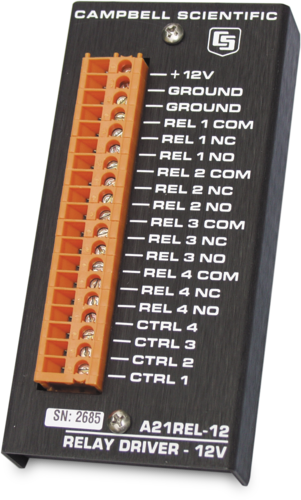 The peripheral is typically mounted in the data logger enclosure with double-sided tape or Velcro.